And that’s all folks! 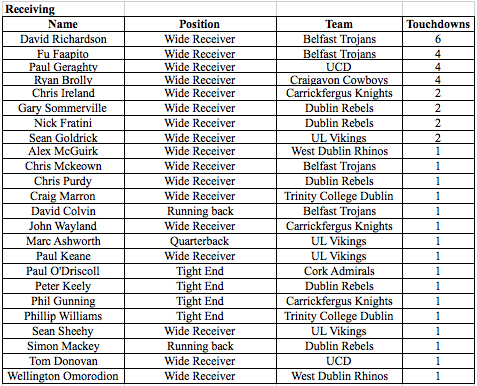 The Shamrock Bowl Conference regular season is in the bag as another weekend of controversial football reigned supreme in Ireland’s top division. 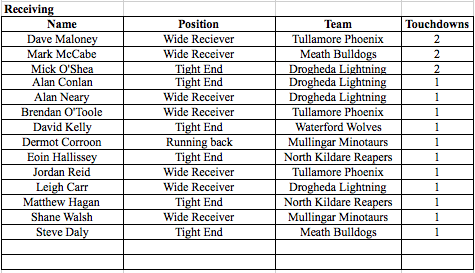 Our top scorers are in and Double Coverage will be announcing details of a League MVP award soon. Meanwhile in IAFL-1 two teams scored wins to help them begin to separate themselves from the chasing pack at the top of the League. Are we beginning to see the IAFL-1 split after a very competitive start to the year? The Champions rounded off their regular season in style, with a convincing shutout over a solid Rhinos side to cap another undefeated year. 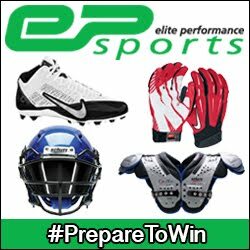 James McKelvey got the ball rolling with a passing touchdown to Fu Faapito (to cheers of “Fuuuuuuuuuuuu!” from the green sideline) after an impressive drive where the quarterback and wide receiver David Richardson connected for several big gains. Peter Roberts added to the score shortly after, bursting into the end zone after a 40-yard rush before Richardson and McKelvey would team up again for the third touchdown. Half time drew with the Trojans leading 19-0. Alex Newton added to the score after the half but the Rhinos continued their strong special teams play by blocking the PAT again. McKelvey rounded off the scoring with a 1-yard rush for a TD to take him to 16 combined for the year, impressive in a 8-game season in a rush heavy league. The Rhinos have concluded their season and will look to bounce back after a tough year. But they’re a strong squad and are capable of coming back better. The Trojans’ next game will be in the EFAF Atlantic Cup and we’ll be bringing you special previews closer to the end of June. The Dublin Rebels overcame the Knights in the battle for second place in the SBC North and sealed home field advantage for the wildcard playoff against the same team in a fortnight’s time. Simon Mackey continued his impressive year, rushing in for his 12th of the year, before then reigning in an Andy Dennehy pass for his first receiving score. Fellow running back Sam Hodgins took over, grabbed a brace of scores himself for the away team whilst wide receiver John Wayland reeled in his first touchdown of the year from an Adam Devenney pass for the home team’s consolation score. The Knights will now head to Santry to face the Rebels on the 23rd June for the chance to face off against Trinity in the semi-finals. Again the hardships of mixing university teams with regular teams in the league came up trumps and caused controversy at the Vikings-Sentinels game. With a small squad (due to the end of university term being near) UCD travelled to Limerick and played but due to injuries in the game it was decided that the away team would pull out 8 minutes from the end and hand the game to UL. Despite their low numbers UCD still managed to cause UL some trouble with iron man wide receiver/outside linebacker Tom Donovan returning a kick return for six. 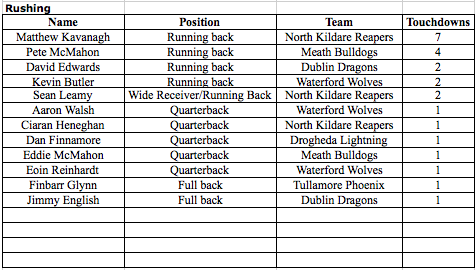 Colin O’Meara passed for the away team’s second score, finding Paul Geraghty for his 4th touchdown of the year. That connection has been impressive this year and will be something to build on for UCD in years to come. 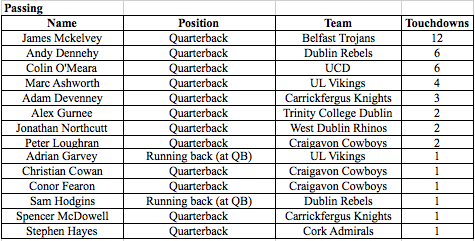 UL’s experienced quarterback Marc Ashworth had a big day to overcome UCD though. He hit Sean Goldrick for one score and Paul Keane for another before rushing two in for himself. A successful PAT and a successful 2-pt attempt to Adrian Garvey rounded off the scoring. 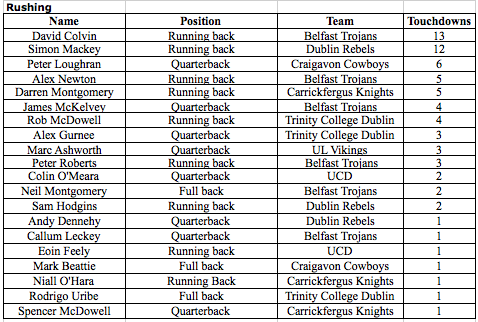 But concerning, after a tough season in the SBC South, is how UCD will fare in the playoffs. With a weakened squad will they be able to fulfil their wildcard game against UL in a fortnight? Hopefully so and hopefully it will be a competitive game. These two met again after the 40-6 Reapers win last time out. Yet again the dominant run game gave the North Kildare side a convincing victory as they begin to put their stamp on the IAFL-1. But it was a passing touchdown that opened the scoring as Ciaran Heneghan hit tight end Matthew Hagan in the end zone. Then the IAFL-1’s leading rusher ran wild. Running back Matthew Kavanagh scored a second half hat trick of scores to take him to seven for the season. The Reapers will face off against the Drogheda Lightning next whilst the Minotaurs head to Tullamore. The impressive Wolves side headed to Tullamore with a large following of fans and came away with another win to take them to second in the IAFL-1. Tullamore meanwhile are struggling in the division as they continue to fail to put points on the board. Their defence is strong though and they added yet another safety to grab their points in this game. 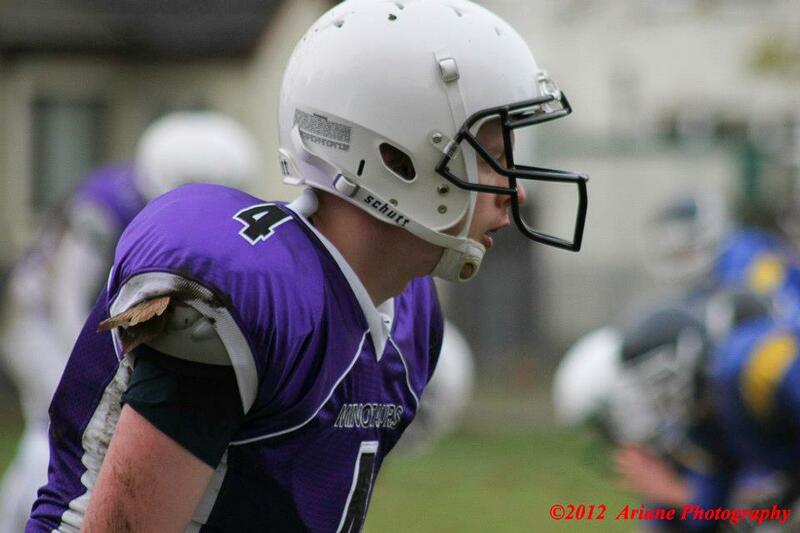 However the defence couldn’t stop the Wolves putting two touchdowns on them though as running back Kevin Butler scored his second of the year to add to quarterback Aaron Walsh’s score. The Wolves jump up to second place in the IAFL-1, hot on the heels of the leading Reapers.